Hang On, Some Relief From Heat Is Coming : The Two-Way The brutal heat wave should break in most parts of the country over the weekend. Still, the 10-day outlook is for temperatures above normal across much of the nation. "As promised earlier this week, a cold front will bring some heat relief to much of the Midwest and Northeast as we end the week and enter the weekend," The Weather Channel says. But, it also cautions that "you may have to pay a price, as this same front will hang around these regions, instigating a persistent 'stormy zone.' "
And, the latest "6-10 day outlook" on temperatures from the National Weather Service's Climate Prediction Center shows that while the brutal heat wave that generated triple-digit readings should ease, temperatures are still expected to remain above normal from the South through the Midwest. The darker the orange/red shading, "the greater is the level of confidence" that temperatures will stay high, the Weather Service says. 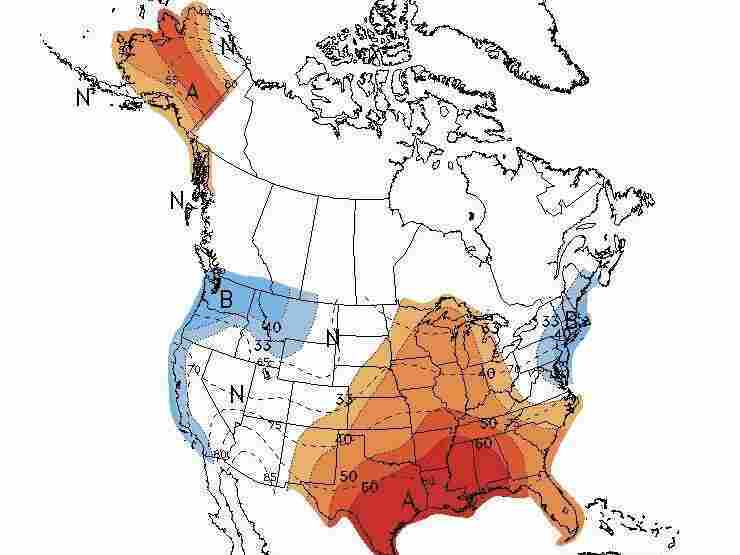 The blue areas can expect below-normal temperatures. The 6- to 10-day outlook.